A delightful blue tomato, one of the tastiest of the blue cherry types. 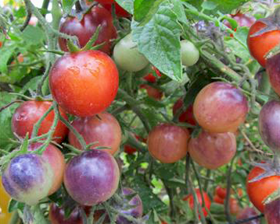 Blue Pitts bears medium to large sized cherry tomato fruits which ripen to a deep red, encased by glowing blue-purple. The fruits don't darken as much as some other blue varieties but are extremely colorful throughout their ripening stages. A great variety all the way around. Height 1.1m.